Hackney is an inner London borough situated to the north east of the centre. It has an estimated population of 269,000, and this is set to exceed 300,000 by 2027. It is a relatively young borough, with 45 per cent of its population under 30. Hackney has seen many waves of immigration and is culturally diverse, with significant ‘other white,’ black and Turkish populations. There is a long established, and growing population of Charedi Jewish people to the north east of the borough in Stamford Hill. Most significant amongst recent arrivals are people from Western Europe, Australia and the United States. Just over a third of residents are Christian and there are significant Jewish and Muslim populations, as well as a higher proportion of people with no religion than London or England overall. There has been rapid economic growth over the last decade and the number of businesses has grown by 68 per cent since 2004. Housing affordability is a key concern, with average house prices just below £600,000 (the London average is £500,000). Just over two fifths of housing is social rented, although the private rented sector is growing and represents nearly a third of all households. From the perspective of social integration, Hackney’s most recent residents’ survey, conducted in December 2015 indicates some key strengths. Levels of community cohesion have remained very high since 2013, with nine in ten residents surveyed agreeing that the local area is a place where people from different backgrounds get along well with each other and the same proportion placing a strong value on social mixing. Residents are also more likely to agree than disagree that the demographic make-up of Hackney has changed for the better. There is also an interest in encouraging and supporting community projects. This was the fifth most frequent response to the question “What could we do differently” in the community conversation, “Hackney a Place for Everyone?” which the council ran during 2015. Despite there being greater economic opportunity, a significant number of local people continue to face persistent inequalities and are disproportionately affected by poverty, unemployment, long term health conditions and welfare dependency. There are also groups who are in work but are struggling with the rising cost of living as well as job and wage insecurity. There is a marked difference between the proportion of residents who feel people from different backgrounds get on well together (90 per cent) and the proportion who people from different socio-economic backgrounds get on well together (70 per cent). Some of the main challenges relate to the way the population and economy have grown and changed over the last decade, leading to social polarisation and social isolation for some groups. In a busy, congested and densely populated place, there are also tensions between different groups or between residents and businesses about the way spaces are used. The 2015 community conversation “Hackney a Place for Everyone?” explores these issues further. Some feel the borough is no longer “for them” as it looks and feels very different and people may have lost their social networks or spaces because people and businesses have been priced out. There is a perception that the features that make Hackney seem ‘special’ are at risk. There is also a feeling that some people need to be better neighbours, to show more consideration and to take greater care of the environment. Residents are split over whether or not they agree that jobs are accessible to them personally, and/ or to the population equally in Hackney. Tackling persistent inequalities, focusing on opportunity, empowerment and prosperity. Considering the impact of cohesion arising from population and economic growth and identifying ways to mitigate this. Providing opportunities for residents to come together, whilst acknowledging these events can also impact on cohesion if they are not inclusive;. Taking an evidence based approach, staying up to date with the changing profile of Hackney’s residents and of residents’ views, and finding ways to hear the voice of newer or less heard communities and keeping the strains and tensions under review. Setting a clear vision for place and looking at the big picture when making decisions and the impact across the whole borough and on cohesion. Creating diverse routes for residents to contribute their views, beyond traditional approaches to consultation and engagement. During 2015-16, Hackney Council carried out a major borough-wide engagement exercise, asking residents for their views about the way Hackney had changed over the past decade. By doing this, they tapped into these ongoing conversations, as well as convening conversations and mediating different views. This wide ranging extensive campaign sought to engage with residents in a variety of ways through debates and deliberative events, face-to-face surveys at over 50 locations in the borough resulting in 2980 responses, video feedback via a specially modified ‘I Love Hackney’ black taxi cab and targeted focus groups. Ipsos MORI were also commissioned to run a repeat of a residents survey last undertaken in 2013 which provided responses from a representative sample of 1,002 residents aged 16+ as a comparator. Scrutiny Commissions carried out parallel reviews, for example one which engaged children and young people. Examine outcomes for different groups over time, to see if the gap between these groups and the population overall is narrowing. Understand community tensions: Hackney has adopted a community tension log which collates insight from surveys, media coverage and stakeholder perspectives. Seek resident views on community relations and belonging, through formal household surveys and through other routes to reach newer or less heard communities. Seek resident views of the Council and statutory sector in terms of whether they are trusted and seen as responsive;. Gauge levels of participation in community life through levels of volunteering and the diversity of residents reached through grant programmes. Programmes which promote social integration are developed through a regular review of these indicators when the Council reviews progress against the Community Strategy and against its equality objectives. Cabinet Members are closely involved in steering programmes and in presenting the work to residents. This is an important part of their community leadership role, giving assurance to residents that tackling inequalities and good community relations matter. There is also a local leadership role for backbench members. Ward forums have been set up to enable ward members to convene meetings about local issues; in many cases these have been about contentious or divisive issues and have been a way to mediate divergent views and perspectives, even if it is not possible to reach a consensus. A strategic review of progress against the Community Strategy in 2013/14 identified growing concerns about economic and social polarisation. Following this review, the Council formally launched a ten year programme and partnership to improve outcomes for young black men which responded to the fact that young black men experience disproportionately worse outcomes across a range of areas. 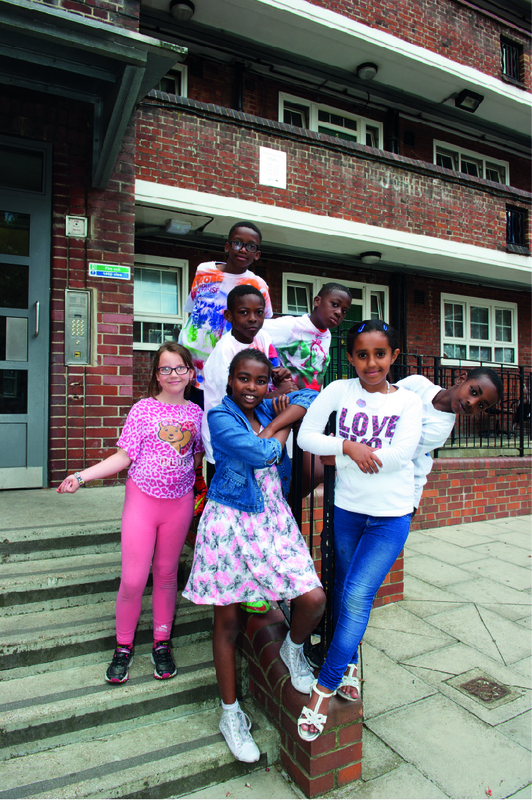 It was around the same time, in 2014, that the council and Peabody launched the Pembury Children’s Community which aims to significantly improve the lives of the 1,000 children and young people living on and around the Pembury estate in Hackney. An evaluation will seek to understand at a more granular level the ways that bothbetter coordinated services and community led support improve individual outcomes and contribute to community cohesion. A long term focus on a specific neighbourhood. An in-depth understanding of the community, both its assets and needs. Partners working together to co-ordinate support from ‘cradle to career’, working across children’s school, home and community lives. A neighbourhood where people are proud to live. A community where people from all backgrounds come together, where everyone matters and there are opportunities for all. A place where young people are encouraged, inspired and empowered to get the best out of life. Partners include Hackney Council, Peabody, schools, health services and the voluntary sector. Together, we want to connect both children and their parents to the existing services in the borough, bringing services closer to the community when needed and exploring how they could be shaped and improved. Alongside this, we are working to build the capacity of the community and individuals to support one another and help themselves, drawing on the many talents and resourcefulness of Pembury residents. Pembury is one of three pilot Children’s Communities in the UK that are being championed by Save the Children and evaluated by Sheffield Hallam University. The Children’s Community was launched in 2015/16 and in the first two years engaged 659 children and 357 parents. All the community initiatives on the estate, led by residents, Peabody, and partners have operated out of temporary buildings in the past. From October 2015, all these projects moved into a new flagship Community Centre, serving the Pembury neighbourhood six days a week. The centre continues to grow: hosting the local children’s centre, surgeries from community psychologists and midwives and a wide range of wellbeing activities delivered by the voluntary sector, alongside youth work, parents groups and activities for older people, with an average of 450 visitors each week. The Pembury Pass project for 16 to 24 year-olds has provided 64 young people with intensive one to one support and coaching in the past two years. 12 of these have been supported out of a severe crisis situation and 35 have moved into education, training or employment. Since April 2015, Peabody has supported 169 local people into jobs. 112 parents have regularly engaged in informal support networks including a Dads group, parents coffee mornings and Reading from the Start family learning sessions. Hackney Council, the local umbrella for the voluntary and community sector, Hackney CVS (HCVS) and local partner agencies, have worked with young people and parents to launch an ambitious programme to improve outcomes for young black men. This responds to the fact that young black men (YBM) tend to fare worse than their peers in many ways, from poorer educational results to higher offending rates. This has been a problem for many years and there have been many responses from public bodies and from the community, but they have not had the impact needed. Rather than tackle individual problems, their approach involves local people, the voluntary and community sector and the statutory sector in shaping and delivering solutions, with young people at the heart of this. A programme led by head teachers has been established to address inequalities in exclusions, behaviour and achievement – recognising the impact that the individual actions of a school can have on the wider community. All members of the partnership have agreed to participate in a challenging programme of culture change. The local Clinical Commissioning Group (CCG) have set up a Reach and Resilience Programme as part of the Child and Adolescent Mental Health Service to address specific community issues and community solutions, focusing in year one on black communities. East London Foundation Trust are co-delivering workshops with HCVS with young black men to test different ways of supporting mental wellbeing based on a strengths based approach. Public Health have committed to run Mental Health First Aid training targeted at frontline workers to help your black men receive earlier help. HCVS has continued to run a holistic personalised programme aimed at getting 18-24 year old black men into work, with 40 per cent of young black men gaining employment. HCVS have continued to engage young people as inspirational leaders and developed a cohort of community organisations committed to the programme, particularly in relation to YBM parental engagement and support. This is a wide ranging programme involving a range of partners. It is overseen by the Policy and Partnerships team at the council who undertake ongoing planning and programme management, underpinned by six weekly meetings with key officers and the Cabinet lead and six monthly partnership meetings. University of East London were engaged to offer critical challenge to partners whilst they were developing the theory of change in 2015. Their feedback directly influenced the final theory of change. They have also developed an evaluation framework which will be used to assess robustness of design and impact. Working on strategic fundraising bids to secure resources to increase the level of community engagement. Developing the leadership role of the youth advisory group of young black men who steer and shape the programme and deliver engagement. Engaging partners who have not been involved to date such as the judiciary. Concerns about some communities becoming more isolated and segregated and possibly holding negative views about the wider community, despite overall levels of cohesion and tolerance. The need to continue to build a strong sense of community by finding new ways to engage as wide a range of residents as possible, engaging with grassroots community networks and making it easier to volunteer. Tackling the borough’s growing inequality with a renewed approach to economic and community development that rethinks what we mean by prosperity and how we harness benefits for local people. Understanding the main lines of tension and develop different ways to promote tolerance and neighbourliness. Understanding how Brexit and recent terrorist attacks impact on Hackney’s population and on community cohesion and resilience.